Enjoy the rest of your weekend and I'll see you all soon! Wow this is really pretty - what a GREAT fall card. I love it - thanks so much for joining in the fun at Paper Cutz this week! Thanks for playing along at cowgirl sunday challenge! It would be great to see you 12th of September at the christmascard for soldiers challenge too! WOW - your coloring on the images is AMAZING! Beautiful job & thanks for playing. Beautiful fall colors and love your card! Thanks for joining us at Paper Cutz this week for the challenge. What a wonderful card!!! Thanks for joining us at Paper Cutz Challenges. Good Luck!!! Very nice, thanks for playing at PaperCutz this week! Very nicely done! Thanks for joining us at PCC this week! 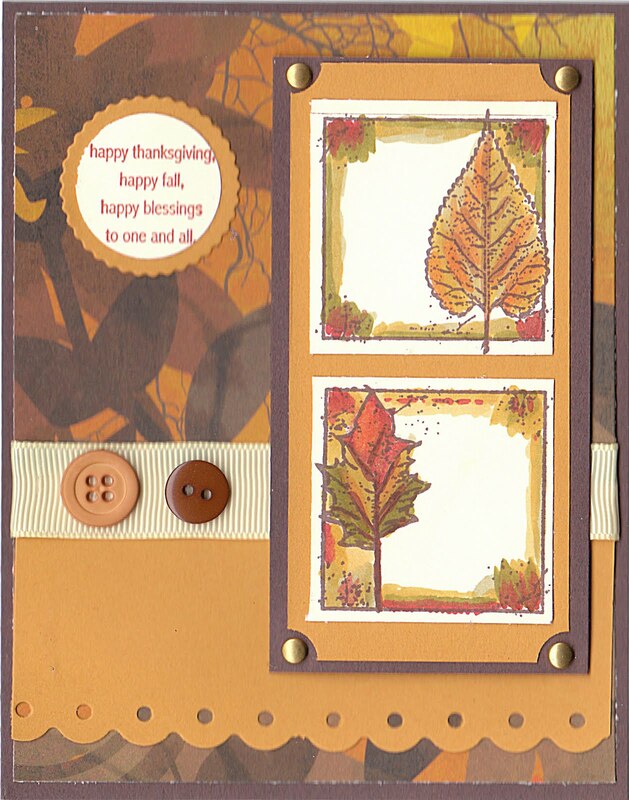 Wonderful fall card. I love fall and all the warm colors. Thanks for sharing your creation at PCC. Love your Fall version of the sketch, Dori! I adore this set ... lovely colors here! What a beautiful autumn card with gorgeous leaves! So glad you could play the Stamp Simply Challenge this week! Pretty card! I love those leaf images! Thanks for playing along with Paper Cutz. Beautiful card Dori... Congrats for the wonderful set you won... amazing colors :... Thanks for joining us at Paper Cutz Challenge this week. Wonderful card. Thank you for joining us at CSSC this week. Hope to see you for our special challenge on the 19th September our Cards For Soldiers!!! Beautiful Autumnal card Dori. The leaf images look fab with the colours you have used.